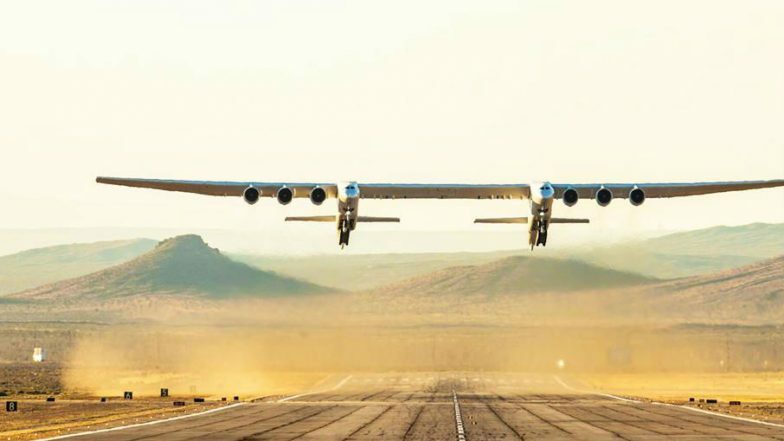 Los Angeles, April 14: The world's largest aircraft, developed by aerospace venture Stratolaunch, completed its first flight test on Saturday. With a dual fuselage design and wingspan greater than the length of an American football field, the airplane took off from Mojave Air and Space Port in California at 6:58 am (Pacific Time), said Stratolaunch in a statement, Xinhua reported. Achieving a maximum speed of 189 miles (302.4 km) per hour, the plane flew for 2.5 hours over the Mojave Desert at altitudes up to 17,000 feet. Airlander 10, The World's Largest Aircraft Will Have Glass Floorings and Private Rooms, View Inside Pics! As part of the initial flight, the pilots evaluated aircraft performance and handling qualities before landing successfully back at the Mojave Air and Space Port, according to the company's statement. "What a fantastic first flight," said Jean Floyd, CEO of Stratolaunch. Regarding initial results from Saturday's test flight, Stratolaunch said the test team performed a variety of flight control maneuvers to calibrate speed and test flight control systems, including roll doublets, yawing maneuvers, pushovers and pull-ups, and steady heading side slips. Moreover, it conducted simulated landing approach exercises at a max altitude of 15,000 feet mean sea level. Stratolaunch was founded by the late Microsoft co-founder Paul Allen in 2011 to develop the large carrier airplane as a flying launch pad for orbital-class rockets. World's Largest Plane Makes First Test Flight.